We Love Koh Phi Phi! Koh Phi Phi Islands are nestled in the Andaman Sea and can be reached by ferry, approximately two hours from Phuket and Krabi. The cluster of 6 islands are part of the Koh Phi Phi National Marine Park and boast white sandy beaches, cool coconut palms, stunning coral reefs and lush vegetation. This is the main island where ferries arrive and depart from the main Tonsai Pier. The geography of Koh Phi Phi is quite unique with towering limestone karsts, with two bays sitting back to back in between. The narrow sandy land in between makes up Tonsai Village where most of the island’s accommodation, restaurants and bars can be found. North of the island are quieter beaches with up market and luxurious resorts for those with a taste of luxury or on a honeymoon vacation. Traditional sea gypsy communities that are the heart of Koh Phi Phi can be found situated in Laem Tong, just a short trek from the main village in Koh Phi Phi. The famous Koh Phi Phi Ley and the Bida Islands are where we take our divers each day. This is part of the National Marine Park and boasts beautiful undersea landscapes, hidden lagoons and sandy beaches. 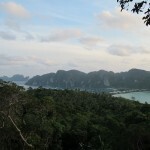 Not only is Koh Phi Phi Leh island famous for Bird’s Nest collecting, it is also home to Maya Bay. Maya Bay was made famous by the movie “The Beach” starring Leonardo DiCaprio. People from Phuket, Krabi, Ao Nang and Koh Lanta make daily trips to dive and snorkel around these islands. 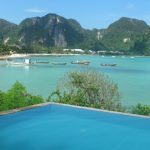 There are many accommodation options on Koh Phi Phi ranging from budget guesthouses to deluxe beach front villas. We can book all types of accommodation through our in-house travel agent Pee Nok. The main guesthouse that we use for our package bookings is Garden Home Bungalows For more information about our Koh Phi Phi Dive Packages , please contact us! To make your trip even easier please view our Dive Packages which include diving, accommodation & ferry tickets. We can also arrange custom packages and book your accommodation and ferry tickets separately. There are many daytime activities and adventures to enjoy on Koh Phi Phi. For the adventurous, there is scuba diving, rock climbing, cliff jumping, jungle trekking, shark tours, kayaking and snorkeling to name a few! Trek to Viewpoint 1, 2 or 3 as this is a must do on the island! Enjoy spectacular view at sunrise or sunset! But don’t forget to bring the 30 THB fee with you, and refreshments are sold at the top. If you are looking for a more peaceful break there is a good selection of things to do to pass your time. There are two gyms on the island for those who like to keep fit on their travels. Enjoy traditional Thai massage by the beach or hire a private longtail boat out to the beautiful Bamboo Island, Mosquito Island or Koh Phi Phi Ley. Trek to find a small, secluded beach to sunbathe on or sip cocktails by a pool enjoying the sunset. Learn something new on holiday! You can take up Muay Thai classes at Aswindam Stadium, try your hand at fire-dancing at Carlito’s Bar, or impress your friends back home with Thai dishes taught in Pum’s Cooking School. There is an increasingly busy nightlife on Koh Phi Phi that caters for everyone. There are several chill out bars like Sunflower Bar, to enjoy the views, cool drinks and chilled music. The beach bar scene is not as crazy as it once was, however you can still find many places for dancing and drinking with your friends. Catch the Muay Thai Boxing at the Reggae Bar each night from 8pm, and spectacular fireshows at beachfront bars like Carlitos Bar and Hippies Bar. The lively and packed Live Music Bar starts around 8pm and goes on until late, while the quieter Kaya Live Music Bar is for hippies who would like more chilled guitar tunes. Both Phuket and Krabi have their own international airports, so getting to Koh Phi Phi couldn’t be easier. For the full Koh Phi Phi ferry schedule, please CLICK HERE! The local market stalls offer the most unique Thai food… but, beware, it can be spicy! Go in the morning when it comes alive with local Thais feasting on local delights of fried chicken, fish curry, sticky rice and sweet treats. The Thai Iced Coffee is a great start to your day, and only 25 THB for a large sugary hit of caffeine! One of our favourite restaurants is Grande Phi Phi Arcade.Not only is it the best service on the island, the surroundings are beautiful and romantic with the friendliest owners! They have fantastic Thai food, fresh coffee and freshly baked bread and baguettes. Great Thai food can be found at Pum’s restaurant, where you can also learn how to cook your favourite Thai dishes and impress your friends back home. For big and cheap portions, Papaya Restaurant is the place to go. There is an amazing Thai/ French restaurant called Le Grande Bleu, located near the pier in a traditional wooden building that is covered in beautiful flowers. It is a special and romantic place to eat. Banana Sombrero Mexican Grill is a great night out with Margaritas and Fajitas. Their Bacon and Guacamole Burger is just the best! For amazing steaks and Scandinavian Food, Unnis will tempt your taste buds. Italian cuisine and fresh pasta and pizzas can be found in La Mamitas, and Cosmic Restaurant. The National Marine Park of Phi Phi Ley and the Bida Islands minimal damage from the Tsunami and corals and marine life are still spectacular and beautiful. Most of the devastation was seen in the reefs around Koh Phi Phi Don, where the damage was the most severe. Alarm systems have now been set up all over the island, and surrounding islands and seaside towns, to alert people of any forthcoming danger and escape routes have been mapped out to Tsunami safe areas. It is tested every fortnight with the Thai National Anthem at 8am in the morning! Located around the island are Tsunami boxes that were funded by charity and people on the island. 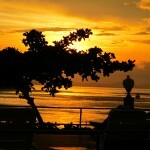 They are situated in safe zones around the island including Viewpoint Resort where we are based. These provide the island with medical, water and radio supplies in the case of another natural disaster. Mostly private NGOs, local Thai groups and grass roots organisations came to rebuild Koh Phi Phi. Each NGO found their niche, and successfully brought the island back, HiPhiPhi, Aree Foundation, Krabi Relief, Releive Toi, Help Koh Phi Phi, to name a few. Blue View Divers is active in projects on the island such as cleanups, school education projects and funding for charities that benefit the islands, such as Shark Guardian. We also run a Thai Intern Program which teaches local Thais, and our staff, how to dive to Open Water Diver and beyond, free of charge. We are very grateful for all the time and hard work so many people put into this island. They have brought together the community of Koh Phi Phi and made the island once again a place that people wish to come back to time and time again.